Who is going to draw a red line on Israel? It is time the leaders cut the strings from Israel. It is obvious to the people how every leader of the world bow to the wishes of Israel. What catastrophe has to occur for the puppets of the world stage to stop the support to this lunatic bunch of psychopaths in Israel? 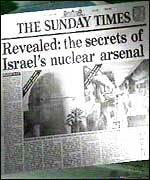 There is no secret any longer that Israel has Weapons of mass destruction, including biological weapons, why the Atomic Agency insist in ignoring the obvious, while pressing Iran and other to summit their nuclear projects to the agency, they pretend they do not hear the story of Vanunu Mordachai, the nuclear scientist that blew the whistle to the world. US invaded Iraq in 2003 with the pretext of looking for weapons of mass destruction, which they found none. The news keep repeating the White house story of North Korea nuclear arsenal, while the world keep wondering why?, Why Israel is allowed to continue with their nuclear program unsupervised? The documentary done by the BBC interviewed dozens of key witness on the case of Israel Nuclear Plant. Mordechai Vanunu, Israel’s nuclear whistleblower, was jailed in 1986 for publishing photographs of Israel’s nuclear bomb factory at Dimona. 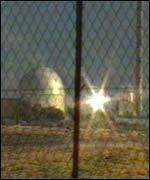 Olenka Frenkiel reveals the extent of Israel’s nuclear gagging. Vanunu has spent 17 years in jail, 11 of which were in a minute solitary confinement cell – and he has just had his appeal for parole denied. So the truth is out, the workers of the plant had talk of reprisals from Israel government if they talk a word to the Press. The sick worker exposed to radiation are not allowed to suit the government due to their sworn of confidentiality. When Correspondent approached one of the workers, who was dying of cancer, he refused to be interviewed – but with some regret. Unaware he was being filmed, he said: “I wanted to talk to you but I have been silenced. “They came from intelligence and told me not to talk. Now Natayahu speaks of Iran nuclear program, as if Israel is the owner of the world and has the explicit authority to rule in other countries affairs. Obama, Clinton, Bush, and all the presidents of the US after Kennedy shake hands with Israel prime ministers and give them promises of no interference with Israel affairs, and financial support. People ask; Why? Is there a human being on earth that can answer that question? Why Israel is let unrestrained? Invading countries, starting conflicts, killing Palestinians in daily basis, target assassinations of leaders and no leader raise a brow. Why? Sometimes I answer that question, thinking that I must be crazy. “Israel people are not from this world and they mastered power of mind control, and perception, and all the leaders in the chair of the world, including kings, and others puppets are Androids” …Go figure! when we have no logical answers we have to resource to imagination. 🙂 Have a good day.